Home Improvement Clinics - This online clinic teaches the basics of replacing old smoke detectors or installing new ones. This important and often overlooked safety precaution could save your life. Don't take chances with your families safety. Do this one today. Technicians Note: Over 1/2 the deaths from fire could have been prevented with a high quality, working smoke detector. 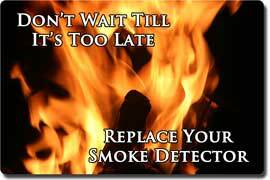 Save money and protect your family by replacing old smoke detectors and or installing new smoke detectors. Smoke detectors 10 years or older should be replaced immediately. Disclaimer - IMPORTANT - Please read our disclaimer and safety tips before attempting this home repair. You Have Been Warned - Now that we have warned you of what to look out for let's move on to the steps you will need to follow. Installing a New or Replacement Smoke Detector - If you have a existing smoke detector or detectors that are over ten years old or are coated in dirt or grime or have been dropped or otherwise damaged then it should be replaced with a new high quality smoke detector. Technicians Note: Do not buy a cheap low quality smoke detector. Buy one that has a proven track record and will get the job done right. 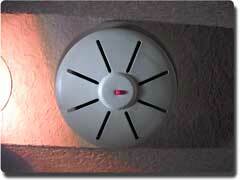 One of the last places you want to skimp is on a safety device like a smoke detector. 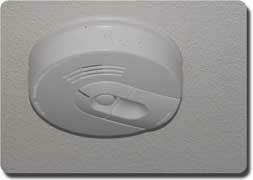 If you need them you can buy professional quality smoke detectors from our online store. * A tape measure or other measuring device. * Variable Speed drill with screwdriver attachment. (*) You may need either a flat or phillips screwdriver depending on the screw used. Additionally on some detectors you may be able to use a 1/4 inch nut driver or socket wrench. Step 1 - Safety First - Make sure that you have read our disclaimer and are following all safe practices and following the recommendations of the manufacturer of the smoke detector. If you are unsure DO NOT attempt this or any repair. Step 2 - Determine the number of smoke detectors needed - Choose how many detectors will be installed. Follow manufacturers recommendations in this area. Remember that you want at least one detector for each occupied bedroom. Step 3 - Locate the areas - Choose the place where your detectors will be installed. Follow manufacturers recommendations. As a rule of thumb the higher you mount the detectors the better. Smoke rises so the higher the detector is mounted the sooner it will alarm. Typically you should place your alarm 6-12 inches from the area where a wall meets a ceiling because these areas create "dead spots" that may delay an alarm. Also don't put smoke detectors near a window, door, under an air conditioning vent, or other area where the air may be lost or the presence of smoke may be obscured. Also putting smoke detectors in kitchens, or bathrooms because steam from cooking or showers, cooking, and etc. can cause false triggers. Areas with fumes such as those from from paint, solvents, chemicals, or gasoline can cause a false trigger. Step 4 - Prepare the Area - Set up the ladder just below the area where the detector is to be installed. Note: Make sure that the ladder is a safety ladder and is stable and safe so you do not fall. Step 5 - Prepare Yourself - Put on your goggles and breathing mask and get the tools you need for the next step. Step 6 - Remove the Old Detector Body (Replacement Only) - Detectors typically come in two parts, the body and the mount. The body can typically be removed by turning the body of the detector freeing it from the mount. Step 7 - Remove the Old Detector Mount (Replacement Only) - There are usually two to four screws that must be removed in order to take the mount down from the wall. Remove them carefully taking particular care to prevent the screws from stripping out the slots in the head of the screw. Also remember that the mount may move and or fall once several of the screws have been removed so keep one hand on the mount to prevent it from moving. Step 8 - Follow the Manufacturer Instructions - Most detectors simply require the screws be replaced in the mount but each detector can vary slightly in installation so follow the instructions provided by the manufacturer. Step 9 - Test The Detector - Once you have finished the installation check the detector to make sure that it is working. Step 10 - Repeat the process - Repeat the process for each detector that needs to be installed or replaced.